I’m glad someone finally said it: Japan is not all cute, all the time. Japan produces many cute things (I’ll admit it, pokémon are pretty cute), and Japanese cuteness is fairly visible in America, where there are vast subcultures of people who idolize it. Part of the reason why Japanese cuteness has spread to North America, Europe, and other countries in Asia is because cuteness appeals to people outside Japan, after all. (And it’s not like mainstream American media doesn’t produce its fair share of appeals-to-men-in-their-thirties cuteness on its own.) I think there is still an oddly pervasive idea, however, that everything that comes out of Japan is either Hokusai or Hello Kitty. 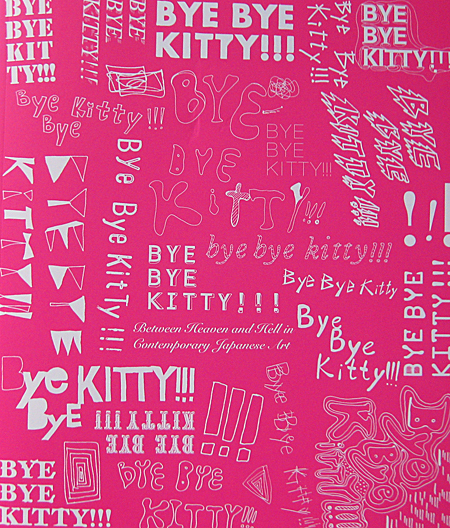 I therefore want to hug David Elliott, whomever he may be, for putting together the Japan Society’s Bye Bye Kitty exhibition and catalog. The artwork is spectacular, and the essay by Elliott that opens the catalog strikes a powerful blow against the assumption that all contemporary Japanese art features huge anime eyes. Many artists, however, … have produced work that indicates a more complicated, adult view of life, melding traditional viewpoints with perceptions of present and future in radical and sometimes unsettling combinations. This hybridity … has created a fertile seedbed in which the struggle between extremes of heaven and hell, fantasy and nightmare, ideal and real take place. There is no room for Kitty’s blankness here. In other words, Japanese artists deal with the same concerns as Western artists, and they do so as adults, intelligently processing cultural and political history and anxieties through creative and technically sophisticated artworks. Elliott identifies three major themes in the work of the artists represented in this exhibition: critical memory (how we deal with the legacy of the immediate past), threatened nature (how we deal with our fears concerning the immediate future), and the unquiet dream (how we deal with our selves). As a whole, the essay is beautifully worded, beautifully illustrated, and well worth the price of the entire book. Elliott’s essay is followed by a short piece by Tetsuya Ozaki, the former editor of ART iT, a gorgeous bilingual magazine devoted to the contemporary Japanese art scene (if you happen to be in Japan, you can easily find back issues on Amazon.co.jp or at major bookstores like Kinokuniya). In this essay, Ozaki makes the connection between “a system that doesn’t make people happy” and the current “floating generation” of suicides, hikikomori, and otaku. He demonstrates how young Japanese artists are resisting “the kawaii phenomenon” as a means of escape and argues for a broader understanding of Japanese artists as adults both reacting to and transcending their cultural environment. Accompanying this essay are timelines demonstrating, for example, the discursive space of Shōwa Japan and landmarks in postwar Japanese art. And then there is the art itself. The catalog showcases the work of sixteen artists, all in their twenties through forties, and all showing large and colorful pieces in this exhibition. In my opinion, the primary keyword for these pieces is detail. Yamaguchi Akira, for example, has two pen and watercolor paintings on the theme of Narita Airport in which the roofs (even those of the planes) are lifted to reveal a minutely detailed Edo-esque fantasy of Meiji bureaucrats rubbing shoulders with women in kimono excusing themselves after bumping into Caucasian tourists fumbling with their cell phones. Another of Yamaguchi’s paintings, The Nine Aspects, is a picture scroll reading from right to left and illustrating the nine stages of decay of a horse after its top-knotted master discards its corpse by the wayside. Except the horse is also a motocycle, and the architecture is half Edo and half Shōwa nostalgia. Time is also compressed in the huge pen-and-ink illustrations of Ikeda Manabu, which depict hulking architectural monstrosities so finely detailed that a magnifying glass is necessary to catch all the small touches, like the bomber planes flying in formation below the golden-ceilinged temple caught up in the branches of an enormous dying cherry tree. Finally, there is Aida Makoto (of Harakiri School Girls fame) whose acrylic painting Ash Color Mountains confronts the viewer with towering piles of dead salarymen, each individually detailed, which somehow makes the spectacle even more disturbing. My one complaint about the Bye Bye Kitty catalog is that, with dimensions of about a foot squared, it really can’t do justice to all of the amazing detail of the exhibition’s artwork, the majority of which is at least as tall as I am. Therefore, if you can possibly get to New York to see the show itself before it closes on June 12, you should go! It’s one thing to see something like Ash Color Mountains while flipping through the pages of a catalog; it’s another thing entirely to walk into a room with no expectations and suddenly find that there it is all around you. The work of Ikeda Manabu especially must be seen to be believed, and the more installation-focused work of artists such as Shioyasu Tomoko and Chiharu Shiota should really be experienced in person. There is not a single boring artist in the exhibition, so it’s definitely worth traveling to visit. The best work of so many unique and high-profile Japanese artists doesn’t come together like this very often, so catch it while you can – or at least consider ordering a copy of the catalog. I am super excited about this exhibit. Yamaguchi Akira is easily among my favorite contemporary artists active today, with Tenmyouya Hisashi, also featured in the show, a close second. Ash Color Mountains is ridiculous and incredible. I had the honor, back in February, for just a few minutes, of watching Aida Makoto -san work on it. The idea that he would recreate the piece, in all its detail, for this exhibit, rather than shipping over an already-made original seems absurd to me, but awesome at the same time. How many tens or hundreds of hours must it have taken to paint such a massive, and detailed, work? I’m excited, too, to hear that the catalog is so worthwhile, with good essays. My mind has been focused on the exhibition, and I keep forgetting that there even is a catalog, though of course I’ll be buying one as soon as I get a chance. Guess what? The have an entire room in the gallery space devoted to Tenmyouya Hisashi’s paintings. Which are of course amazing. I never appreciated his technical proficiency as an artist until I saw them in person. Speaking of which, I can’t believe you got to see Aida Makoto painting. Wow. I’ve kind of been stalking David Elliott, but I’m having trouble finding anything else he’s written. Do you have any recommendations?